The abstract portal has now closed. Thank you for your submissions. All abstracts are now being reviewed and we will inform you of the outcome shortly. The organisers at their discretion may still accept some late breaking abstracts. Should you have an abstract, please forward it to acpasm@phlebology.com.au for consideration. Acceptance of a late breaking abstract will remain at the discretion of the organising committee. 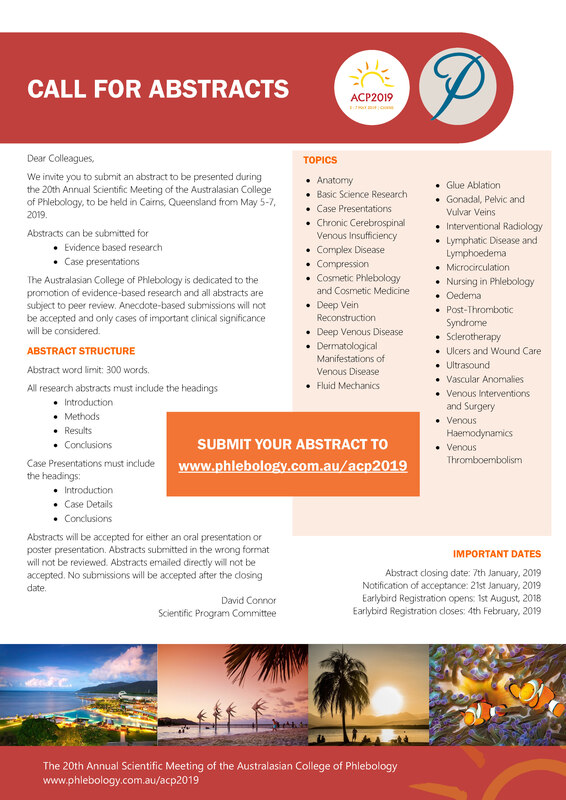 We invite you to submit an abstract to be presented during the 20th Annual Scientific Meeting of the Australasian College of Phlebology, to be held in Cairns, Queensland from May 5-7, 2019. The Australasian College of Phlebology is dedicated to the promotion of evidence-based research and all abstracts are subject to peer review. Anecdote-based submissions will not be accepted and only cases of important clinical significance will be considered. Abstracts will be accepted for either an oral presentation or poster presentation. Abstracts submitted in the wrong format will not be reviewed. Abstracts emailed directly will not be accepted. No submissions will be accepted after the closing date.